The above headline is a difficult one with the disasters happening almost continuously in different parts of the World. Good news has become rarer and rarer. Ones heart goes out to the poor people -especially the children - in many of these countries torn by strife on an almost daily basis. Although there have been some isolated terrible things happening in some European countries by and large we can be thankful for our relative stability. Still we must remain optimistic and hope beyond hope that things will improve in 2017. Although this blog does not normally get involved in politics with Brexit in the UK and President Trump in America it is difficult to remain optimistic. On the painting front the death of Ron Ranson was reported last week in Portland, Oregon, where he moved with his American wife Darlis a few years ago. I was trying to discover how old Ron was - certainly well into his eighties. 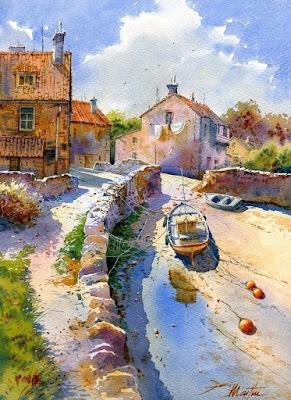 Ron will be remembered for his significant impact on watercolour painting. Certainly his teachings and books - nearly thirty - have had a great affect and many are painting who would not be doing so without him. He was a great showman and I remember being on two short workshops at his lovely house and grounds in the Forest of Dean. 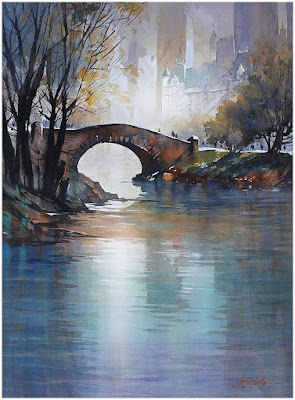 This was at the later stages of his career and to some extent he was going through the motions by then, but many artists who later became well-known passed through his workshops. As is well-known I am a follower and admirer of Charles Reid. I discovered last week that he is coming to England again in late 2017 on a Travelrite/ International Artist painting holiday. Although I had decided, whatever happened in the future, the workshop at Stow on the Wold would be my last I sent for details out of curiosity. It appears to be a ten day all in holiday with painting, starting in the Cotswolds and finishing in Cornwall. The price with single supplement is over £3500! According to the company there are 20 places and 16 were already booked. See his website for details. I have more or less decided that 2017, my eightieth year, will be the last year when I will be active on the blog. As regulars will have recognised I have been winding down this year and finding it difficult to come up with original and interesting posts. There is a lot of good stuff in the back catalogue, most of which is still relevant, so explore the Index in July 2014 if you are interested. Finally may I once again wish all those who are followers or just interested visitors, the very best for Xmas and the New Year. Whatever you do keep painting! Blockx are a Belgian company originating in 1865. Blockx was started by Jacques Blocks, a wealthy chemist. It is today run by Jacques Blocks, presumably the great grandson of the founder. The famous Salvador Dali writing about the founder said "50 secrets of craftsmanship...."This man who never painted, will contribute more to the painters of tomorrow that what we will have accomplished all the modern painters together". Some praise but remember this was in the 1860s. 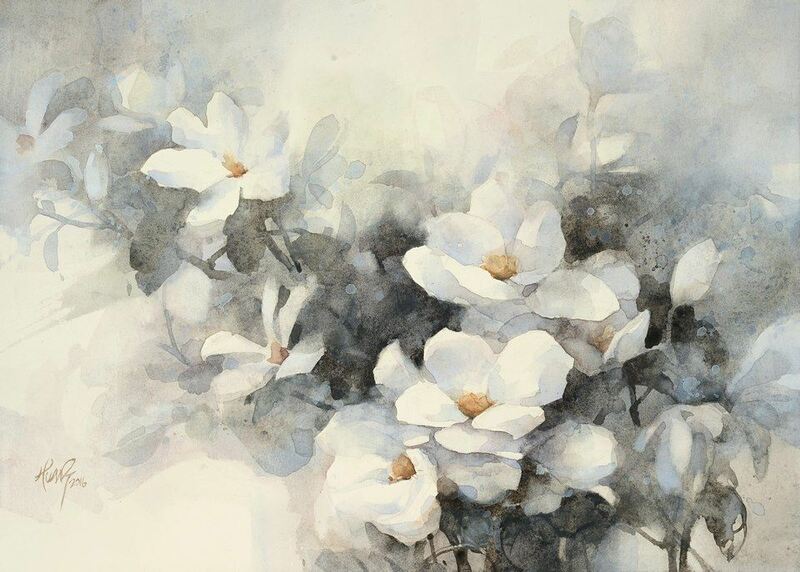 The current watercolour range, they were updated in 2008 ..."vastly improved"according to Handprint comprise 72 colours 82% of which are single pigment paints. Naming is the usual mix with a few anomalies like Blockx Yellow (PY3), Blockx Green (PG7). They do two versions of Burnt Sienna 'Light' and 'Deep', Pyrrolo Vermilion (PO73), Quinacridone Red/Rose (PV19) is called Rose Lake Pale and Rose Lake, also Magenta. Blockx Blue is PB15:1 which is Phalo Blue and so on. Overall not too bad but you need to refer to the pigment information to be fully aware of what you are getting. The pigments used are all good and in line with other major manufacturers. Blockx use gum arabic and a small amount of honey in their formulation. What does Handprint say about them - and here's the rub! The good bits are "a few gems....Viridian, Cobalt Violet."..... "delightfully varied selection of 16 earth (iron oxide) colours" "All the above have assertive granulating Texture". Unfortunately things then go downhill. Bruce McEvoy of Handprint when in full flow (no longer unfortunately) though admitting the new range was ' vastly improved obviously considered that the need to do this didn't reflect well on the company, and wrote that they had been making 'false claims' about some of the paints. He's said this about others like Lukas who did something similar. This led to an exchange of e-mails between him and Jacques Blocks who complained bitterly about his damning of the paints. Read Handprint if you are interested. In addition or alternatively read what the artist Jane Blundell says on her blog. These are the giant 3 inch pans. You can see how big they are in the photos above and below. The smaller tube is actually 15ml, The larger one is 36ml or even larger but I've never seen it advertised for sale over here and was unaware they did such a size. 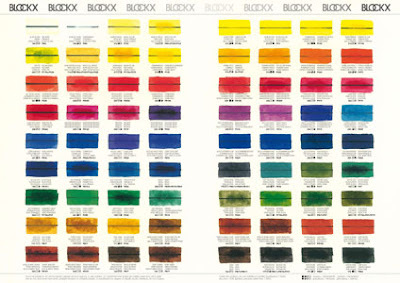 Unfortunately the pigment information is unclear but you can download this chart from Blockx website. I've never used Blockx although they are available from Jacksons and Great Art and appear so from the leading American mail order specialists. The only artist I know who used them was the late Zoltan Szabo but he also has a Maimeri palette and a Winsor and Newton one. If you search on Youtube for 'Blockx' at least two videos come up including an interview with Jacques Blockx (in French!). Blockx website is; www.blockx.be/en/products/aquarelles.asp just google 'blockx . The following paintings were in response to the subject 'Winter Scene' at a recent AVA session. After the last lot I posted on here - including quite a bit of dross - were greeted with a deafening silence I determined to only post paintings in future that I consider acceptable. In this instance I actually did two in a roughly two hour session, but took the trouble to do both drawings the previous day in my'studio' so I could concentrate on the actual painting. I find when I do it this way I get a better result. It allows me to be rather more careful in my approach rather than slapdash. This includes studying the subject (and guide photograph) at leisure. I enjoyed painting and drawing this one. One of the main colours was the Graham Quinacridone Rust (PO48), which is a gorgeous paint. Annoyingly Graham is only available in the UK from W E Lawrence of Hove, who offer a good price when you buy 6 tubes but have a fixed carriage charge of £4.95p. This adds nearly 82p to each tube. They refuse to budge on this citing 'superior service' whatever that means. I find the companies that offer free carriage over a certain value - typically £40 - give a perfectly good service. The same pigment PO48 is offered by Daniel Smith - available from Jacksons and others as Quinacridone Burnt Orange, very similar perhaps slightly darker. 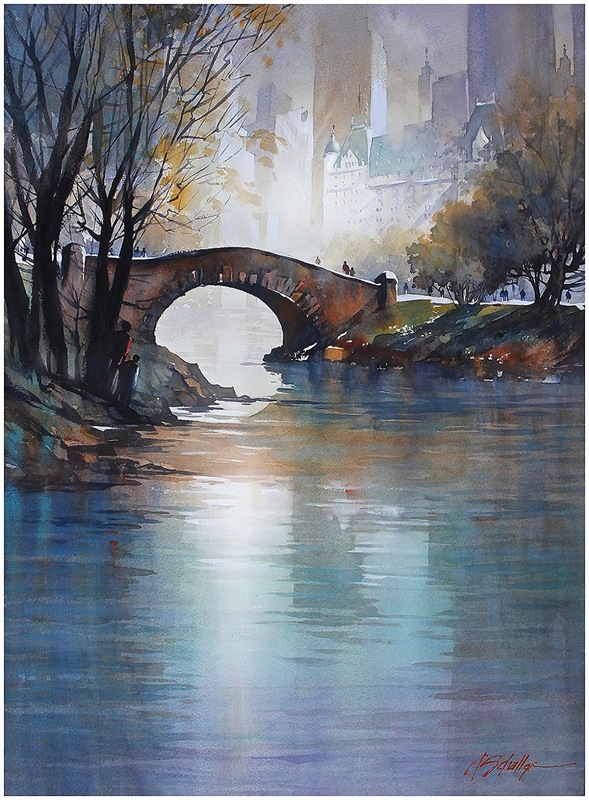 Although Daniel Smith paints are dearer than Graham I'll have to bite the bullet and order a tube when I next place an order for the AVA. As for the Cornwall paper it produced a good result and was easy to work on. Being heavier than my normal 140lb Waterford it resists buckling as the blocks are very well made. In any event I don't find this a problem as I don't use heavy washes. The size is slightly smaller than the 16" x 12" Waterford so I'll probably stick to Waterford. Because it is a heavier weight Cornwall doesn't work out much cheaper. This months batch of paintings follow and as usual I've tried to provide as varied a batch as possible. I hope you like them. 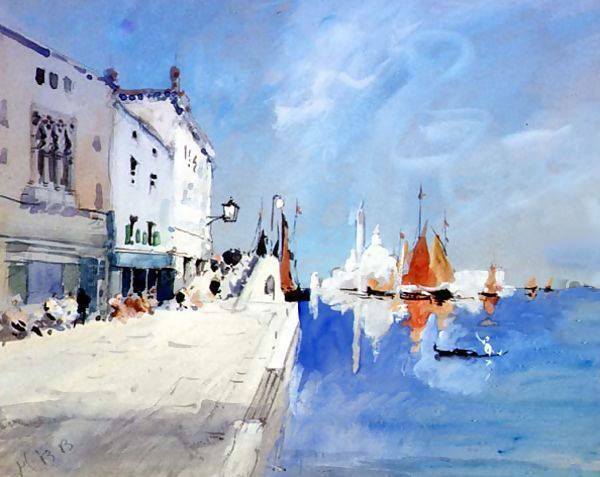 I met Gilles Durand - one of the best French watercolour artists - on two Charles Reid workshops. 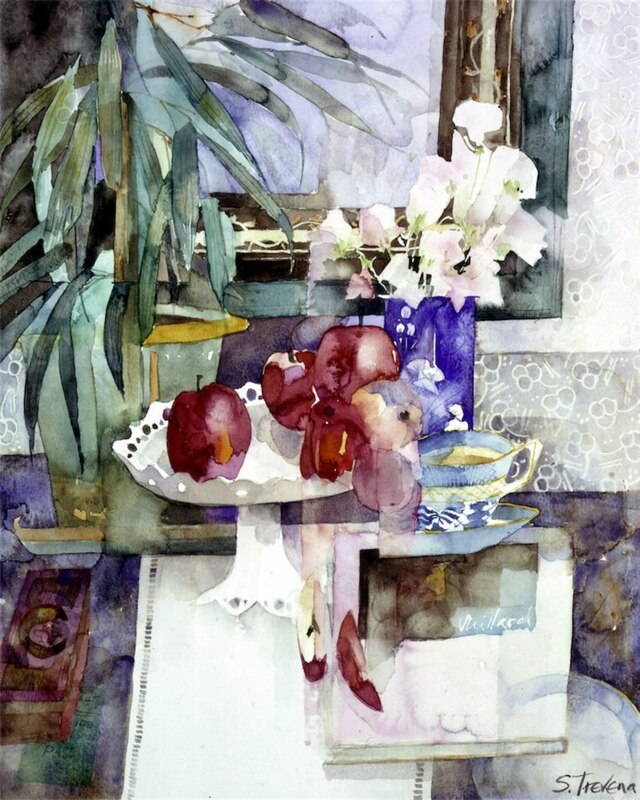 Shirley Trevena is one of the most acclaimed British watercolour artists while Barbara Nechis is a highly acclaimed American artist. Most of the others I don't know much about but they are on Facebook so should be traceable if they interest you.